The temperature has been 41degC (106degF) in the shade, rather more in the sun. The whole country has been starved of rain and the harvest is forecast to be half or less of what is normal; many smallholders will have close to no harvest at all. Prices of vegetables and fruit will rocket and a lot of Romanians will go hungry. Many Romanians, including my family, have shut themselves inside and complained about the heat. But you know about mad dogs and Englishmen, no doubt. Coming from the appalling summer in England I was determined to get some real sun but I did, for once, wear a hat. I went into the town centre in bright sunshine. The sky darkened, lighting ripped it apart and, a few paces from shelter, the heavens opened and I immediately had a power shower. Within two seconds or less I was soaked. We might say it was bucketing down; the Romanians have a similar expression: “ploua cu galeata” – ‘it’s raining with a bucket’ – and it was. 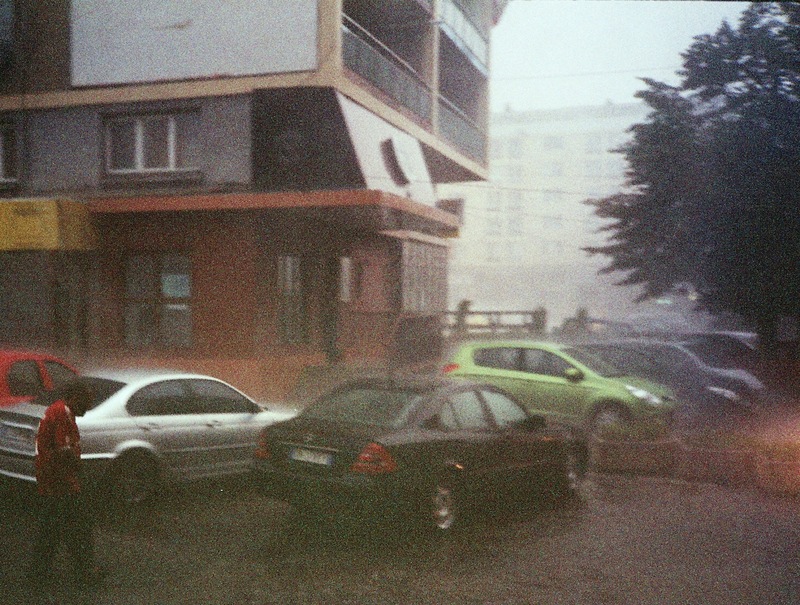 I sheltered in a hotel entrance and was quickly joined by several very wet Romanians. Every one complained about the rain. Then we were joined by a gipsy boy, maybe 17 or 18. “Decand a plouat, arata frumos” – “(how long) since it rained, it looks beautiful”, he said. Photo: Fuji Superia 200, expired film. Olympus XA (35mm, f.2.8 F-Zuiko). Long hand-held exposure. Probably f.5.6. Commercially developed and scanned in Iasi, Romania. Good for the straw I guess, but not so good for you – the worker. Take the plunge; you’ll love it. Best time is Easter (Romanian – Orthodox – Easter that is). I’d love to go, everything about it appeals!